Over the past couple years as the economy has been slow to rebound, much of the general discussion about commercial real estate investment activity across the U.S. has recalled the old adage about "flight to quality" when times are tough. And rightfully so: despite all the opportunistic "dry power" capital lined up to jump on distressed assets, the real hot commodities have been well-located, well-leased properties - and primarily in top-tier markets like New York, Washington, Boston and Chicago. Accordingly, cap rates attached to these core assets have generally compressed as their values have recovered disproportionately to more standard income-property fare. In the small-cap sector, this trend has played out particularly with properties net leased to credit tenants and public-sector agencies - in the primary markets as well as smaller metros. However based on the latest research from Boxwood Means Inc., it appears small-cap investors have become more optimistic as they've targeted the stronger going-in yields achievable in quite a few well-regarded secondary and even tertiary markets. While it's difficult to generalize, details of Boxwood's proprietary small-cap sales indices indicate a lot of these less-glamorous metros saw sub-$5-million valuations appreciate with considerable more gusto than the biggest markets from late-2010 to late-2011. In fact among the 20 top-performing markets in the 102 metros tracked in Boxwood's SCPI-100 that registered positive small-cap price growth during the year-long period, only Boston and Cleveland made the cut. Otherwise, the winners were all subordinate cities led by Rochester, NY, New Orleans, Dayton and Tulsa with positive annual returns ranging from 8 to 15 percent. And only a handful or so of other primary markets rank among the 50 top performers: New York, San Francisco, Houston and Philadelphia. 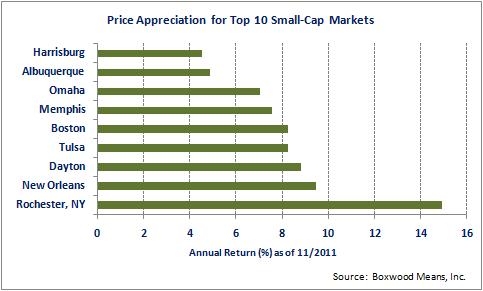 So what does the superior appreciation among those scattered second- (and third-) tier markets mean? While veteran income-property broker Bruce Marshall notes that many investors remain focused on lower-risk assets, he also suggests a lot of small-cap players are jumping on riskier plays in anticipation of considerably better days perhaps not too far ahead. "People are starting to open their minds to a different risk profile," says Marshall, a Dallas-based managing director with Sperry Van Ness who has brokered small-cap sales in markets large and small across pretty much the entire country. Higher prices in many second-tier markets likely reflects a burgeoning sentiment that supply-demand fundamentals will continue reverting toward equilibrium - pulling up operating incomes and, in turn, valuations. Indeed savvy investors are well aware of the historical pattern in post-recession recoveries, i.e., that market rents at some point rise sharply over fairly short periods - rather than in consistent, gradual fashion. "And in many markets we are in fact seeing more solidification in occupancies," Marshall continues. "Investors are becoming more active and aggressive because they're seeing the incipient stages in rental-rate increases," which will likely spread generally to pretty much all income-property categories within the next 24 months or so, he adds. In other words savvy buyers are now looking beyond mere going-in yields and realistically drooling at potentially outsized IRRs over three- to five-year horizons - and not just distressed properties they can pick up at big discounts to peak valuations. They realize a solid new lease or two might provide a windfall as rents and values continue upward. Moreover, prices of small-cap properties are attractive to owner-users in local markets who can lock in a fixed and low-cost basis for operations based on very favorable financing. Of course, Boxwood's overall results for SCPI-80, comprising 80 secondary/tertiary markets, indicate that near- and intermediate-term appreciation prospects are far from uniform in these smaller markets. The upper portion of the performance roster is heavy on markets boasting clusters of well-positioned industries - and Marshall for one recommends casting fates with the energy and technology sectors in particular. To wit in energy-driven markets like Tulsa and Oklahoma City, as well as tech-heavy Boston and aerospace center Dayton, respective SCPI scores are now within 5 percent of their peaks. But Marshall cautions that certain markets may carry disproportionate economic risks - especially those threatened by additional military cut-backs (and general federal government austerity as well) as Congress hammers out debt-reduction policies. Those risks don't necessarily apply to markets bringing up the SCPI-80's rear including several Florida communities such as Sarasota, Jacksonville, Ft. Lauderdale, Palm Beach, Orlando and Ft. Myers. Other notable under-performers among the smaller cities include Reno, Rockford, IL, Fresno and Mobile. All of these metros have suffered one-year losses ranging from 14 to over 30 percent with declines from peak prices that amount to a whopping 40 to 75 percent. Such steep price erosion over four plus years suggests that even these beaten-down markets may grow attractive to investors and owner-users, as the downside risk to further price depreciation diminishes, especially as housing markets and the national economy gain strength.